Broadview Entertainment Arts University (BEAU) is part of Broadview University. Broadview’s Salt Lake City campus became BEAU in 2011 to create an institution focused on preparing students for careers in the entertainment arts. BEAU operates from a simple, yet critical, mission: We Care. It’s this mission that highlights the benefits of BEAU. Yet these benefits and student successes were missing from their current website. 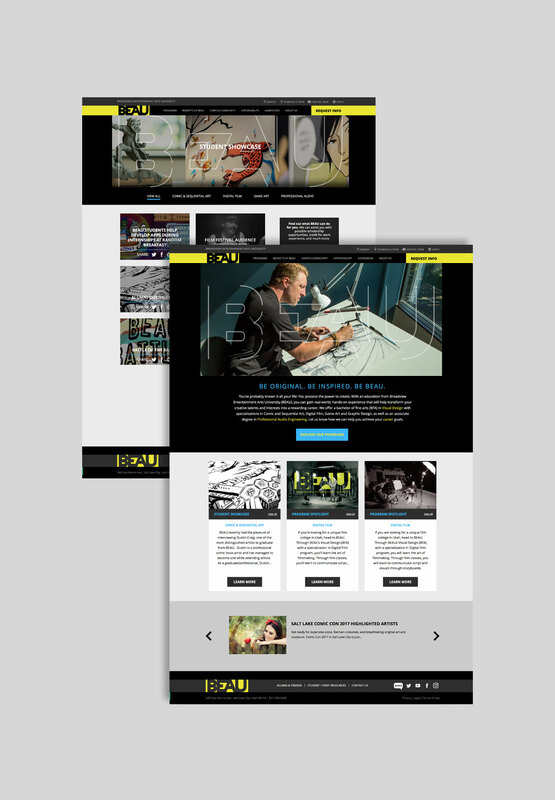 BEAU asked Creative Mellen to build a web presence to better reflect its mission. To better highlight BEAU’s mission and innovative programs, we re-architected the entire site. We created specific sections to highlight student and faculty work, feature programs, and spotlight the university’s benefits. Subtle typographic animation with “BEAU” highlights the innovation and digital programs upon entering the site. Other interactive elements such as program pop-ups and videos keep the site dynamic and allow for less clicks to find the relevant information. Another important component was lead generation, so we built the overall site with that in mind. We added an interactive “Request Info” button within the header to appear on every page for easy access. This element simply slides out a short form to gather prospective students’ information. This easy and quick access for the user encourages action. With the new architecture matching BEAU’s goals, we created a dynamic site for creative-minded students and faculty while maintaining the functionality for easy maintenance, updates, and lead generation.